I’m a latecomer to the idea that mobile gaming on phones (and conceptually tablets) is actually a way to play and enjoy good and interesting games. As a lover of interesting narratives and unique indie ideas, this market should be right up my alley (assuming I stay away from all of the microtransactions). Unfortunately, it has never caught my fancy before, and I do believe I’ve determined why (and the fewer games on the Windows Phone Store isn’t it). I despise touch controls for most games. For some games they can be great. But generally, the more of a traditional game for other avenues like consoles or PC the mobile game is, the less I feel the controls are acceptable. Virtual joysticks and buttons on the screen at best clutter the game itself and, more often, cause my own hands to get in my viewing area. And besides getting in my own way, it is very easy to miss one virtual button for another since there isn’t any tactile feedback. Enter the MOGA controllers. These are Bluetooth game controllers deigned to be used with phones. Additionally, contrary to what MOGA’s web site says, they work great with Windows Phone 8.0+ as well. I actually have a Samsung Ativ S Neo. And it has transformed my phone from a laughable gaming experience to a wonderful one. My beautiful wife was kind enough to give me a Moga Pro Power as a gift. Inside the box, I found 2 USB A (standard) to micro (cell phone adapter) cables, a folding plastic stand, a tiny getting started guide, and of course the controller. The cables in the box come in the 3 foot and 8 inch variety. The 8 inch is supposed to go from the controller to your phone to charge it (more on that later) and the 3 foot is just for charging the controller. It’s a shame that it doesn’t come with a wall adapter. As a really minor annoyance (as the box implies), these are strictly charging USB cables. That means they cannot transfer data if, for instance, you connected your phone to your computer using these cables. The guide talked about going to the Google Play store and downloading software and other things for Android but didn’t mention anything about Windows phone. Windows Phone setup is extremely easy overall. While the controller is charged (or charging), switch it to “A” mode. In Settings->Bluetooth, you should see an entry (mine first showed Accessory, but eventually showed MOGA Controller after a couple seconds). Click the controller and it’s paired. That’s all. Now you just need to start your game and all should just work. There’s a couple small caveats that I’m pretty sure are my phone and not the controller: First, at least for Snes8x, it needs to not be running when you pair your controller (not suspended either). You can exit it by focusing the app and pressing back until it goes away. Secondly, I had to start my app pretty quickly after explicitly telling it to connect to my controller each time. We’ll talk about this more later, but after upgrading to 8.1, this requirement went away. Physically, the controller is pretty nice, though the button construction doesn’t feel as nice as an Xbox 360 or Wii U Pro controller. The buttons feel a bit extra stiff and a bit louder on the click, but there isn’t a problem there. I actually like the D-pad more than I do the Xbox 360 controllers as the stiffness helps to make the different directions easier to feel. The weight is less than my wireless Xbox 360 controller with 2 AA batteries in it but more than my Wii U Pro controller. Overall, it feels pretty good especially since the phone adds an extra weight to the set up. With my phone in it’s center clamp, it doesn’t actually tip over, but doesn’t sit flat either. When holding the controller with a phone, it is definitely front heavy, but it doesn’t bother my wrists or otherwise detract from the experience. Speaking of that clamp, that is the way that phones attach to the controller. When not open, the clamp folds down to protect the power button (which is great when stored in a bag). When folded out, there are soft clicks to keep the clamp folded out with your phone. The clamp has rubber on the inside to prevent the phone from slipping out and stretches nicely. I leave my phone in its case when using and have read it can even support phones the size of the Note 3. The tension isn’t too high, but the rubber seems to do all the work. This could be a benefit if any of your phone’s buttons are too close to the clamp. My controller being the Pro Power, we definitely need to talk about battery life. 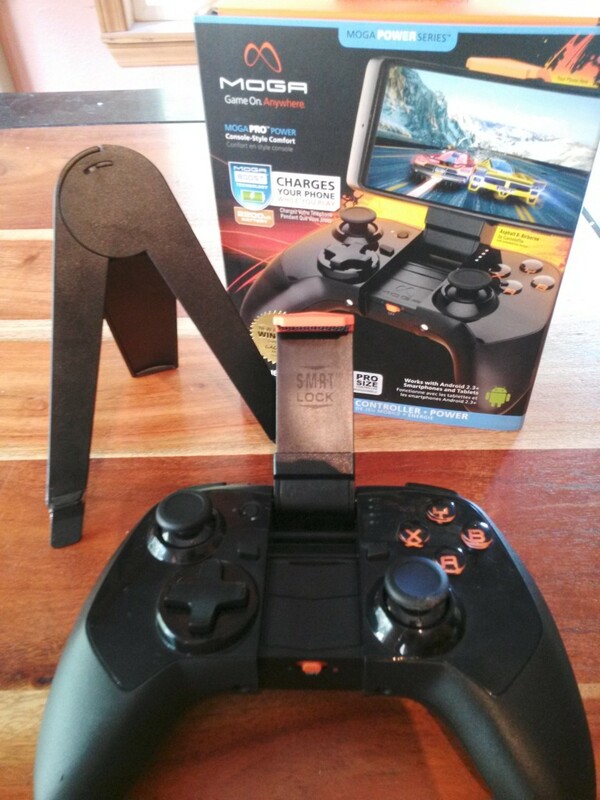 As mentioned above, the signature feature is the ability to charge your phone while using the controller by using the small USB charging cable. You need to orient your phone correctly to ensure the cable reaches, but otherwise, set up is a breeze. I’ve read reports that some phones do not actually detect the cable as plugged in. My phone worked perfectly with it though. It charges essentially as fast as the battery is going down when I am playing games which is great. The problems start coming in with what could be seen as limitations. The Pro Power has a 2200mah battery in it. The first 75% of this I burned through while charging my phone in about 5-6 hours. Personally, I find this to be quite acceptable, but it definitely isn’t enough time for a full week with it charging my phone. The last 25% is interesting. The controller will only charge your phone if it has more than 25% battery life. This does mean that if you hit that level while playing, your phone will just stop charging (which I didn’t realize had happened until my phone was much lower on battery later in the day). The controller keeps working well at this point though. I didn’t run the battery to 0% because I wanted the phone charging feature. I’ve read from others who didn’t charge their phones that the controller lasts about 17 hours (which means the last 25% could last around 4 hours). Charging the controller is as easy as plugging in the usb port, but the controller will also not charge your phone when the controller is plugged in. This means that if you want to play and charge your phone and your controller, you need 2 separate power cords. I would have loved to see a better solution here, but it’s not deal breaking. In the end, a controller with no games to play isn’t very useful. Windows Phone is especially susceptible to this between the fewer games total and the complete lack of marketing that Moga controllers work with Windows Phone. As of writing, there are 24 results for “moga” in the Windows Phone store of which 7 are emulators. Unfortunately, this isn’t actually the full list. I know that at least three games from Gameloft have Moga support now (and maybe more). I wouldn’t doubt that many games that have Moga support on other platforms also have Moga support on Windows Phone. When in a game with Moga support, it really feels like you are playing with an integrated mobile system. I didn’t notice any lag or other issues when using the controller and (after sometimes enabling the support) it just works like magic. I was extremely pleased with the results and my gaming experience improved substantially. As an added bonus, Moga controllers also can work with Windows itself. I have not gotten this to work myself (due to PC problems with Bluetooth, not any issues with my controller), but I see it as a great advantage that you additionally get a rechargeable desktop controller as well. I am extremely happy with my Moga controller. The design may not be perfect and some of the decisions involving when the controller doesn’t charge my phone aren’t my cup of tea, but the overall experience and value is great. The hours and hours of entertainment provided along with not needing yet another device is fantastic. For many, this will provide most the features you really want from something like the NVidia Shield without the price tag. And this allows you to keep making progress on your games without the controller and the experience only get better when you have it. 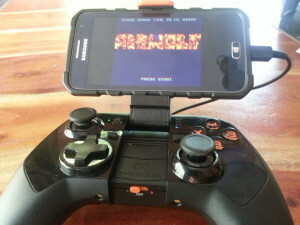 If you want to really play games on your phone, a Moga controller is a must.